AQUEOUS ROOMS is a brand new (2015) luxury yet affordable Short Stay Furnished Apartments accommodation. We are located in Port Melbourne, approximately 4km south-west of Melbourne city centre. Port Melbourne is a beautiful beachside suburb by the shores of Hobsons Bay. On its waterfront is Station Pier where the Spirit of Tasmania ferry departs for Tasmania daily. There are sandy recreational beaches, exclusive apartments, nice restaurants, good cafes, open parklands and local shopping, all within walking distance. It is also not far from Albert Park Lake where the annual Melbourne Grand Prix Formula One (F1) is held. Getting to Aqueous Rooms Port Melbourne is easy using public transport and eliminates the need to have a car which requires inconvenient and expensive car parking. Trams, buses and bike paths will connect you conveniently with other parts of Melbourne. However, if required there are some free street parking in the vicinity and inexpensive covered parking starting from $5.00 overnight. Tram: 109 from Collins Street, Melbourne City to Port Melbourne takes about 20 minutes. The tram route passes by convenient points such as Box Hill Shopping Centre, Richmond (Ikea), Swanston St (connecting to Melbourne University & RMIT), Southern Cross Station (Skybus to airport) and Melbourne Crown Casino. Staying in Aqueous Rooms Port Melbourne means you get the BEST of BOTH WORLDS, near to the city and other attraction points but with the relaxing feel of a holiday accommodation in beautiful relaxed seaside surroundings, within short 50 metres stroll to the beach. Choose from a range of our 1 bedroom units (can sleep 2 to 4 persons) and 2 bedroom unit (can sleep 6 persons) fully furnished luxury yet affordable accommodation. All units come with fully equipped kitchen with cooking utensils, washing machine and clothes dryer. 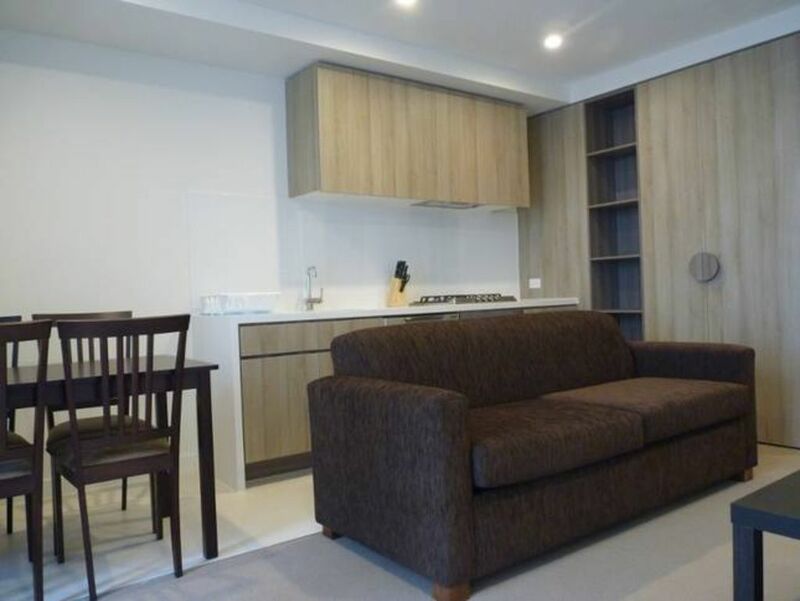 SHORT STAY FURNISHED APARTMENTS 50 meters from beach at Port Melbourne. AQUEOUS ROOMS are brand new 1 bedroom fully furnished apartments which can sleep from 2 to 4 persons. 2 persons can sleep in the bedroom and 2 persons can sleep on the sofabed in the living room. The bedroom has 2 x super single beds which upon request, can be combined to make a king size bed. The living room sofabed is queen size and is comfortable and strong enough to sleep 2 adults. The small modern kitchen is fully equipped with a stove, oven, grill, microwave, dishdrawer, fridge and cooking utensils. All plates, cutlery, crockery and mugs are provided. You can cook your own meals and save on the cost of expensive dining outs. The unit has its own laundry facilities with a washing machine and a clothes dryer saving you the trip and cost to the local laundromat. Bed linen, towels, pillows and duvets/doonas provided must be left where supplied in the bedroom or bathroom on departure. Further linen may be hired through Management. Beach towels are not included. Cleaning and linen change usually occurs weekly or more often upon request and at additional cost. WiFi is available at an additional small daily fee. Free car parking on the street is available in the immediate surrounding areas or secured overnight parking is available nearby from $5.00 overnight. AQUEOUS ROOMS has multiple 1 bedroom units available and a 2 bedroom unit which can sleep up to 6 persons. A pre-authorised Security Bond of $350 is required at least 7 days before the day of check in. Credit card details must be provided for this purpose when requested. Where no additional charges/fees have been incurred, no deductions are made. Repair or replacement of damaged, lost or stolen property, excessive cleaning requirements, lost keys and extra guests beyond those declared will be charged against the credit card. 1. A non refundable 50% deposit is required on confirmation of booking and the balance is payable 30 days before arrival. 2. Where your stay commences in less than 30 days from the time of Booking, the full amount must be paid up front. 3. Cancellations made less than 30 days prior to arrival will forfeit the total monies paid. 2. No disturbance of neighbours, no undue noise when entering and leaving the premises, no behaviour likely to cause damage to property or offence or embarrassment to others, all noise to cease before late night. charges for security, cleaning, garbage removal, wear and tear, repairs etc. Please take extra care and precautions NOT to lock yourself out of the apartment to avoid a call out fee of $80.00 (weekdays) / $120.00 (after hours -5.00 pm - 9.00 am /weekends). Our apartments do not come with a parking space in the building. However there are ample free street parking in the vicinity. Wi-fi can be made available for a small fee of $5.00 per night x no. of nights for each stay. Fee is negotiable for stays longer than 14 nights. Small balcony with table and seating for 2. Thank you for your kind words Alan and Larraine. We're glad you enjoyed your stay with us and thank you for keeping the place clean. You're welcome back any time. Really convenient location, well priced and am looking forward to staying again. Thank you for your review Nat. Glad you enjoyed your stay with us and thank you also for leaving the place clean and tidy as well. Philip was so accomodating and helpful. Great location and great walk along the port to public transport. We loved our stay! Thanks so much for your kind words Mareeta. Hope to have you stay with us again soon. The apartment is cosy, clean and close proximity to beach, shops, public transport. Excellent and easy communication with Phillip. Very minimalist in regard to cooking utensils, a guest manual would be helpful to advise how to work the appliances, general information etc. Thank you for your feedback Debbie. All the user manuals for the appliances are in the cupboard next to the fridge but we take your point and will try and have a summary written up to make things easier for the guest.